Ursula Matulonis, MD, interim director of the Susan F. Smith Center for Women’s Cancers. This is an exciting time for those of us engaged in research and patient care for ovarian cancer. As we’ve learned more about this cancer – its early formation, molecular machinery, and the body’s defenses against it – we’ve also come to understand its weaknesses. An array of new therapies that target these vulnerabilities are now being developed and tested in clinical trials, many of them at Dana-Farber. Our aim is to find which agents, in which combinations, work best in which patients. One of the greatest recent advances was learning there are different subtypes of the disease, each with different risk factors, cells of origin, genomic profiles, aggressiveness, and treatment. 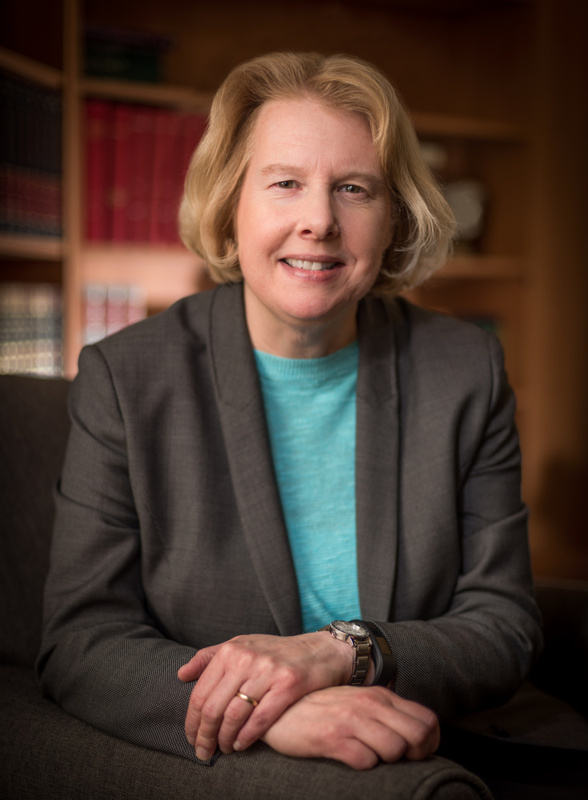 Scientists at the Susan F. Smith Center for Women’s Cancers at Dana-Farber have also found that high-grade serous ovarian cancers – the most common type of ovarian cancer – often originate in the fallopian tubes. These and other discoveries changed the course of research so that novel drugs are geared to patients with specific types of the disease, improving outcomes significantly. We are now testing several categories of drugs in clinical trials, often in combination with one another, with chemotherapy, or as single agents. Anti-angiogenesis agents, such as bevacizumab and cediranib, seek to deprive tumors of access to the bloodstream, limiting their access to nutrients and growth-stimulating compounds. Since many patients taking platinum-based chemotherapy eventually develop resistance to the drugs, we are studying the genomic changes that occur within cancer cells after exposure to platinum. When is two better than one? Because treating ovarian cancer with a single drug has had limited success, drug combinations may offer greater promise. The right combination can attack tumor cells on multiple genetic pathways at once, which is essential in a disease with as many genomic irregularities as ovarian cancer. Some clinical trials are pairing PARP inhibitors with targeted therapies, immunotherapies, or anti-angiogenic drugs. Immunotherapies are being tested in combination with chemotherapy agents, targeted agents, and even with each other. Such trials, which have opened at Dana-Farber recently, will help us know which drugs are most effective against newly diagnosed cancers and which work best for recurrent disease. We’re particularly interested in drugs that work together, each enhancing the other’s effectiveness. 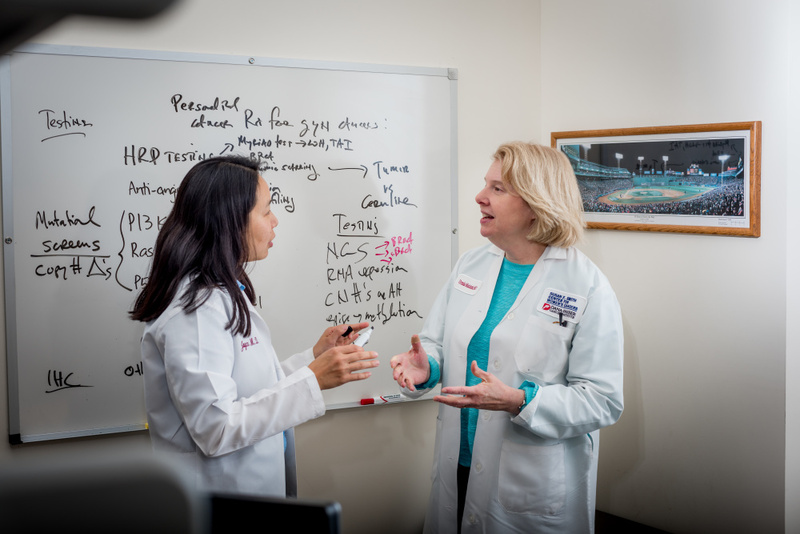 Matulonis and Joyce Liu, MD, MPH (left), study drug combinations to treat ovarian cancer. One of the greatest challenges in treating ovarian cancer continues to be that the disease often isn’t noticed until it has spread beyond its original site. Improvements in early detection can make a big difference in a patient’s outcome. In one study, an algorithm known as ROCA performed as well as transvaginal ultrasound in detecting ovarian cancer, but didn’t reduce patient mortality. In fact, the U.S. Food and Drug Administration earlier this month recommended against using this test at all. More research is needed to determine its long-term prospects as a screening tool. Work is being done in the lab of Dana-Farber’s Dipanjan Chowdhury, PhD, using microRNAs as a possible early detection test. Today, we can offer greater hope to patients with ovarian cancer. As the results of clinical trials of new therapies and combinations become available in the next few years, we’ll be able to refine our treatment strategies to ensure that each patient receives the treatment best suited to her type of cancer.